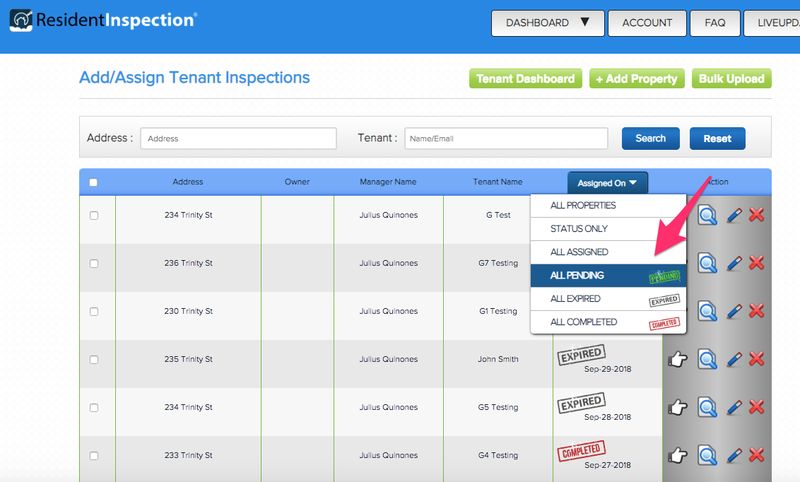 If you are currently using Inspect & Cloud and your properties are already in the system then your properties will be available to assign tenant inspections. 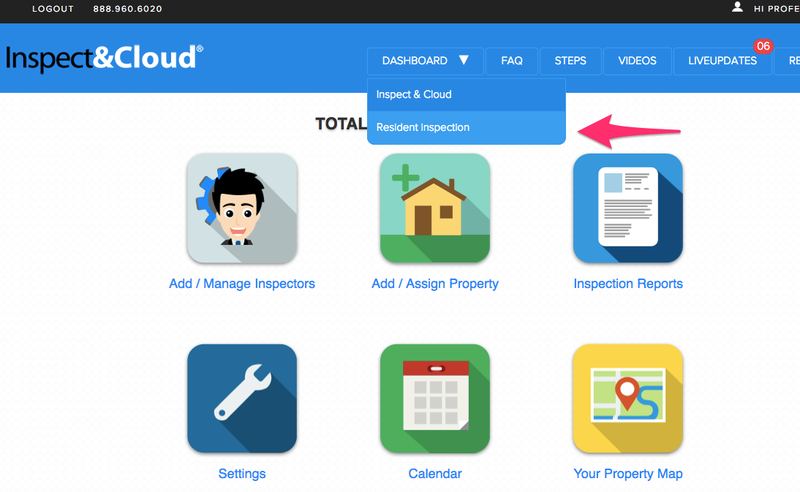 If you are not already using Inspect & Cloud then you can use the bulk upload feature or enter properties by using the Add New button. 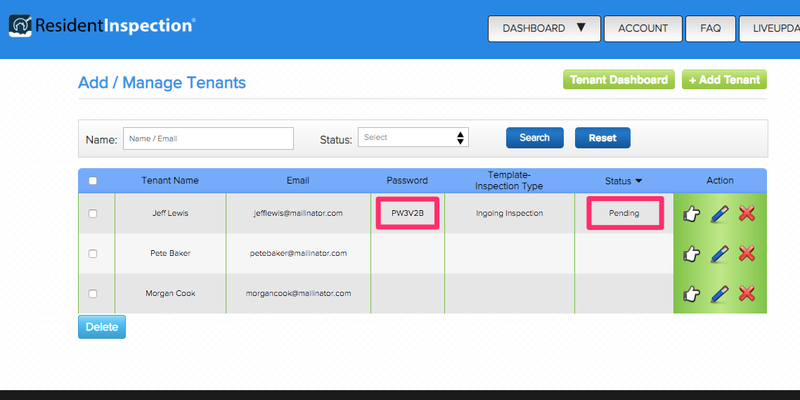 Website Resident From – you can optionally use a Resident Request Form for tenants to request login credentials. 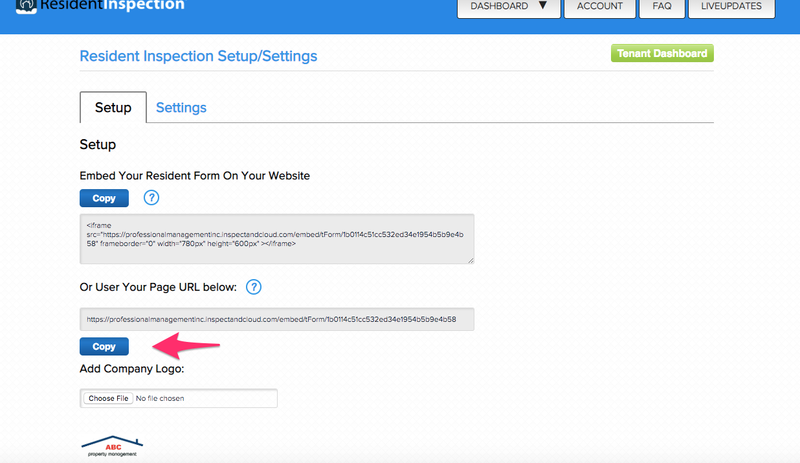 If you chose to embed the Resident Form on your website then the email instructions will contain a link to your website so tenants can request login credentials and the expiration will start once they request. 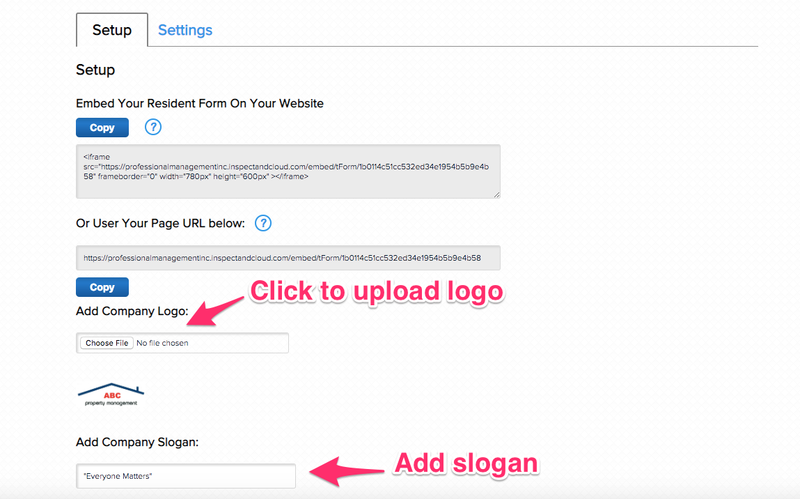 Resident Form – (same as above) if you select this method then the tenant will receive your branded url for your Resident Form instead of your website. 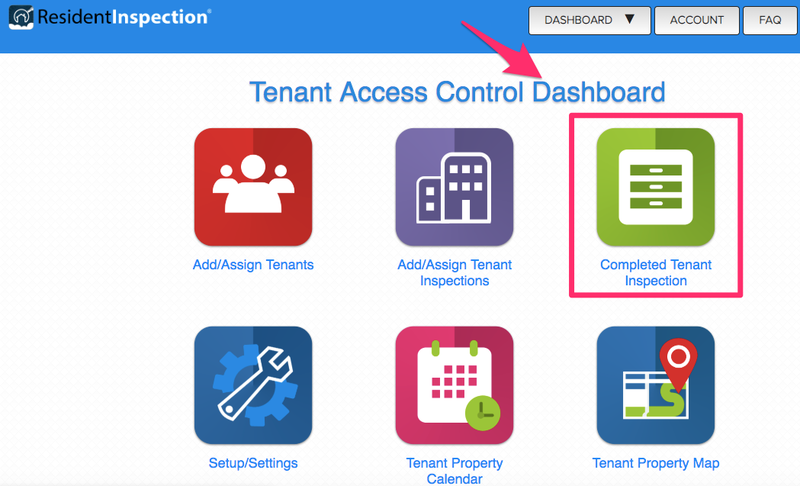 App Login – (skips the step for tenant to request login) if you select this method then the tenant will receive their login credentials and the expiration will begin immediately. 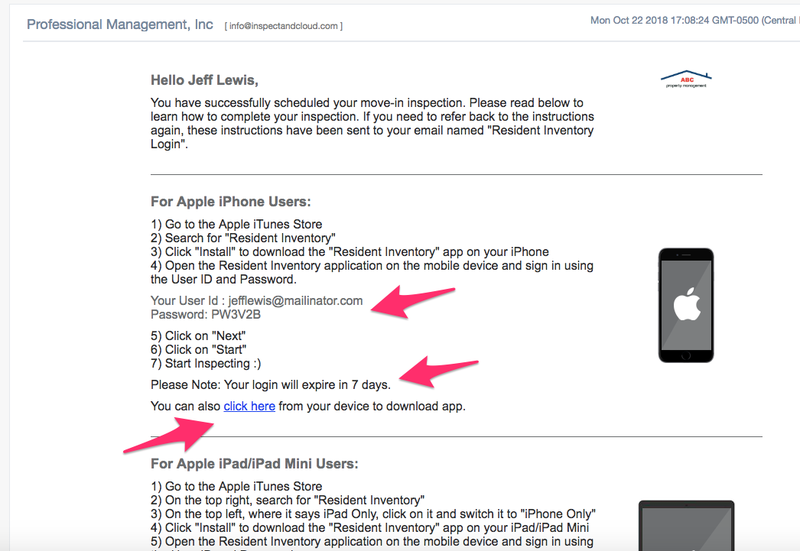 Tenant Receives Login Password with instructions with your companies branding to download app and complete move-in inspection. Tenant Can Complete Move-In Inspection if they don’t complete then the move-in is automatically submitted with as-is. 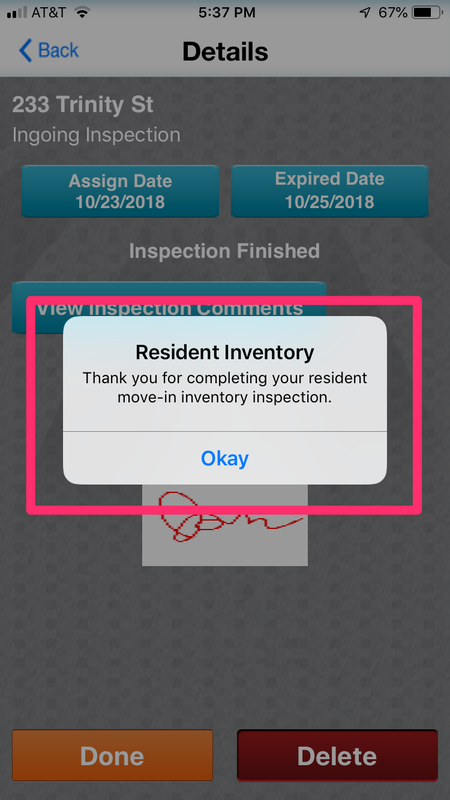 Property Manager Receives Move-In Inspection and can use the Move In/Out Report to compare side-by-side. 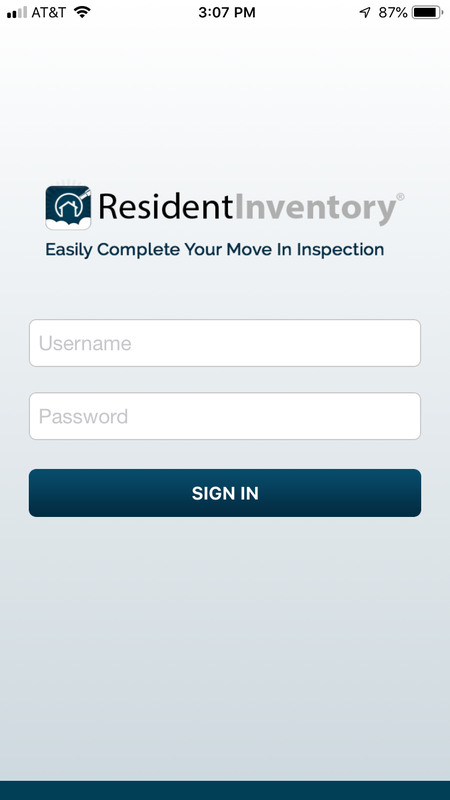 Using a Resident Form method enables you to create a system in the event you have a processing fee or another reason to delay tenants accessing the app immediately. 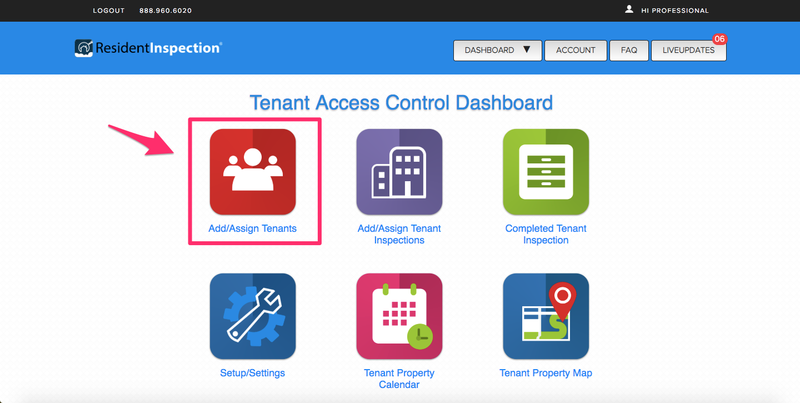 Using the direct Assign App Login method gives tenants access immediately. 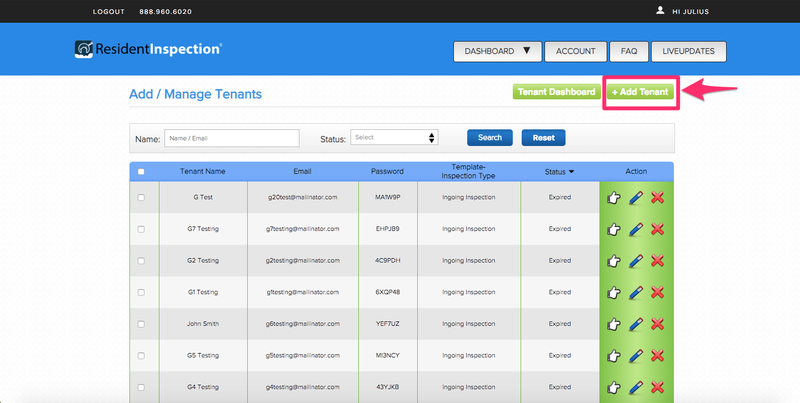 Resident Form 24/7 Access – having the form available for tenants also enables them to request login credentials any time in the event they accidentally deleted or are not able to locate their login password. Resident Form Url – this is your url that will remain the same and contains your company branding. This can be posted anywhere on your site and is a simple method to make your Resident Request Form available. Before getting started there is a one time setup. Some of these are optional. 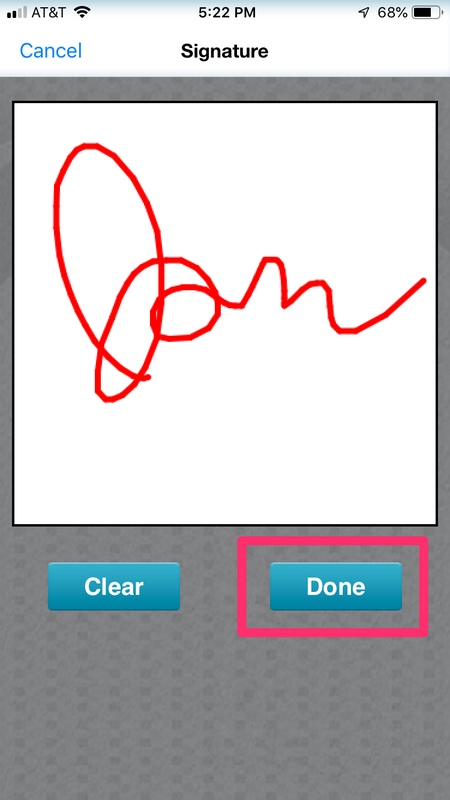 3) Add Slogan and Logo – type the slogan you would like to appear on the app. 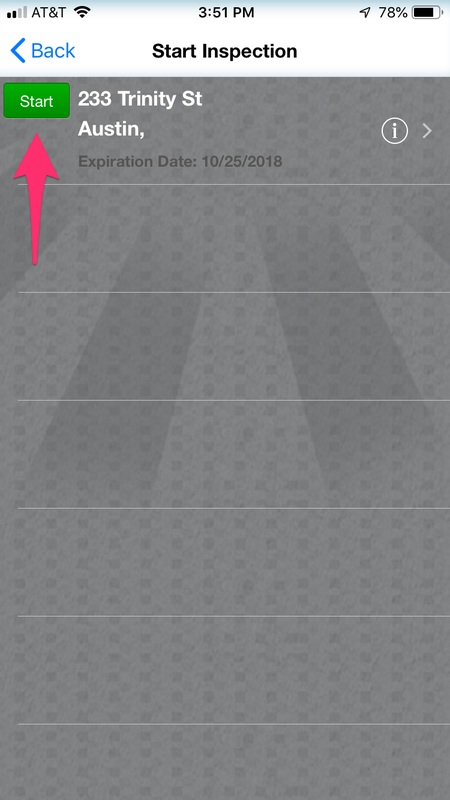 If you are already using Inspect & Cloud then your logo will be displayed here. If you need to upload your logo just click ‘Choose File’ to upload and don’t forget to save changes. 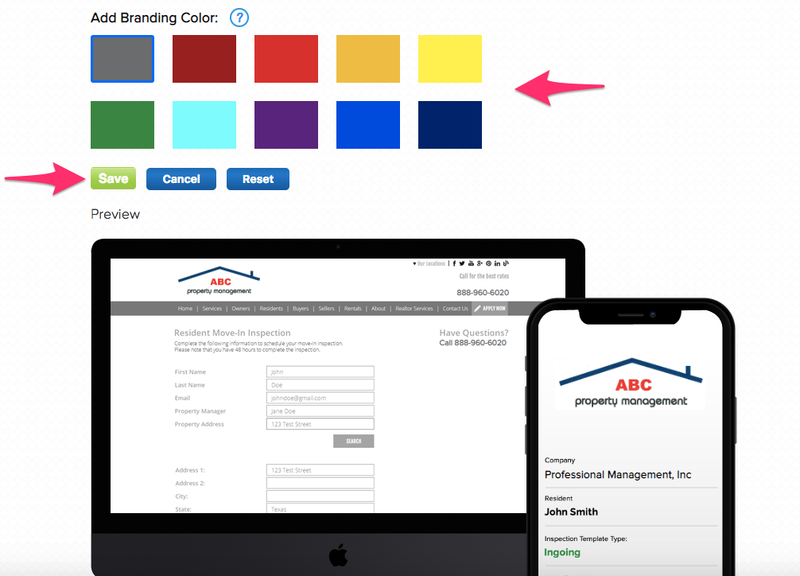 4) Select Color – select your company branded color choice and click Save. You can use the image previews to see how different color changes will appear. 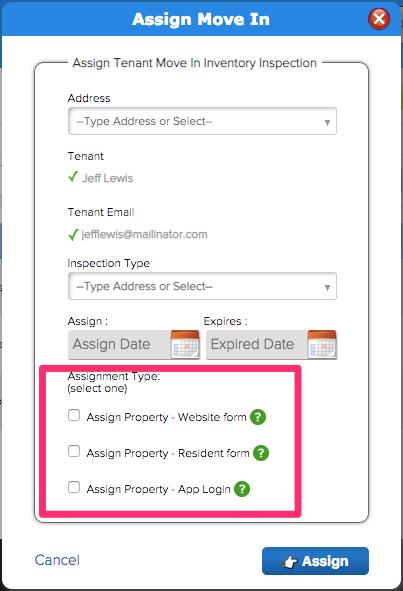 5) View Your Resident Form (optional) – if you choose to use a Resident Form for tenants to request login credentials you can test the appearance by copy/pasting this link into your browser. 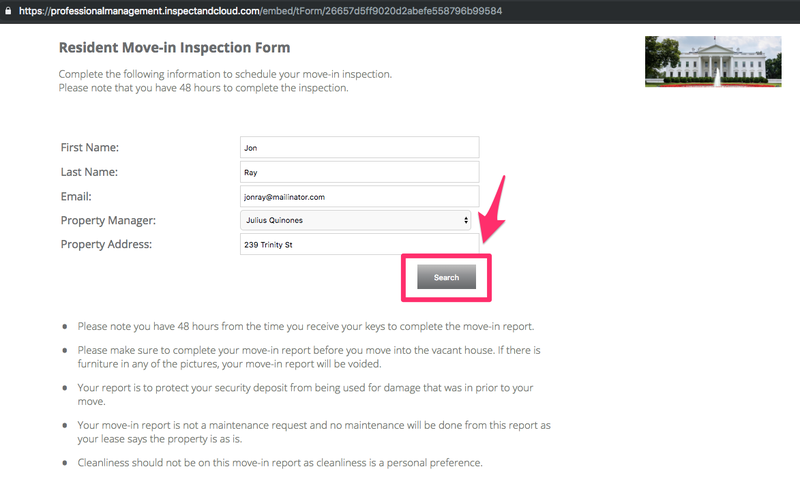 7) Select Tenant Login Expiration – this is the amount of time you allow for tenants to complete their move-in inspection before their login expires. Don’t forget to click Save if you make changes. 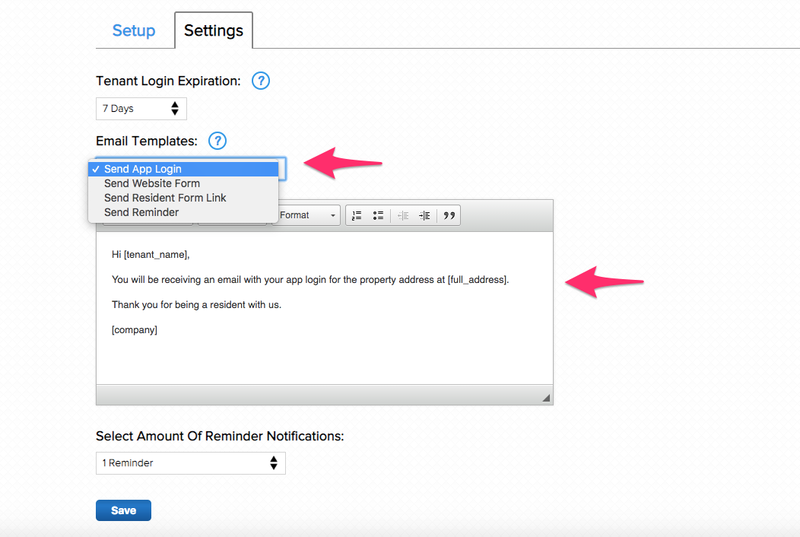 8) Modify Email Notification Templates (optional) –Your messages are already preformatted. 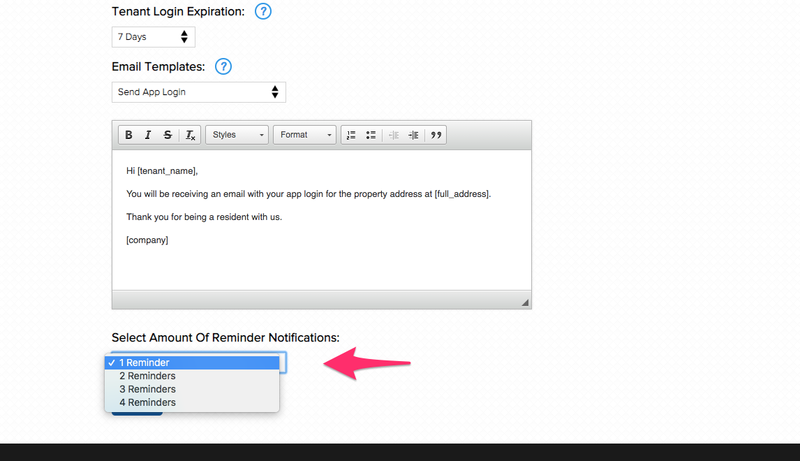 if you choose you can customize all tenant notification emails to your needs. Please ensure not to modify the text inside the brackets [ ]. 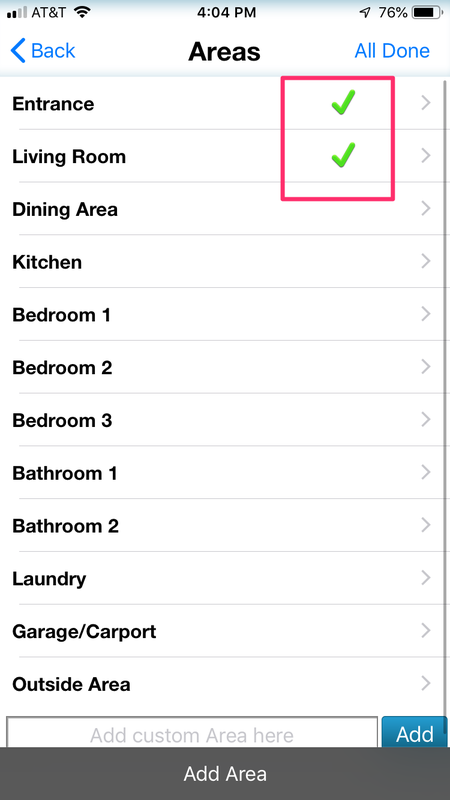 These are your variables and will auto populate info such as address, tenant’s name, etc. 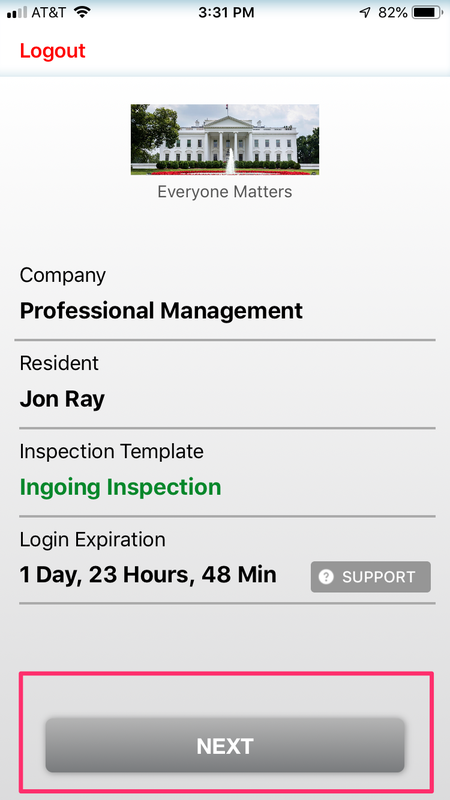 9) Select Amount of Reminder Notifications (optional) – this enables you to set the amount of reminders you would like tenants to receive for their reminders to complete their move-in inspection. Click Save. Setup is complete, your all set! Address – just start typing the address you would like to assign and your property database will display for the property you are trying to assign. 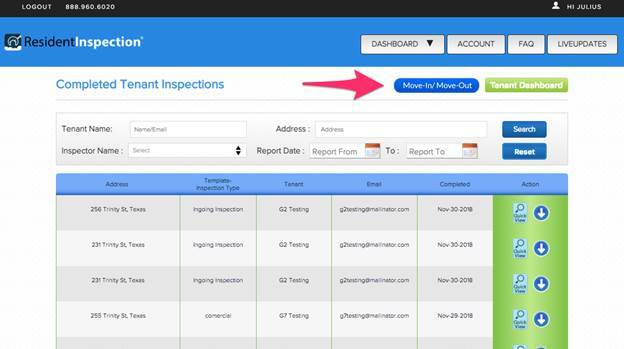 Inspection Type – select your template you would like to assign such as Ingoing. Your custom templates are also available here. 7) Tenant has been assigned as Pending and their password has been generated. 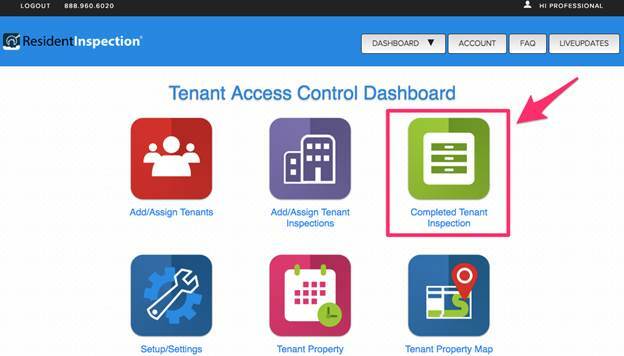 9) After tenant completes their move-in inspection – you will receive an email notification with report link. 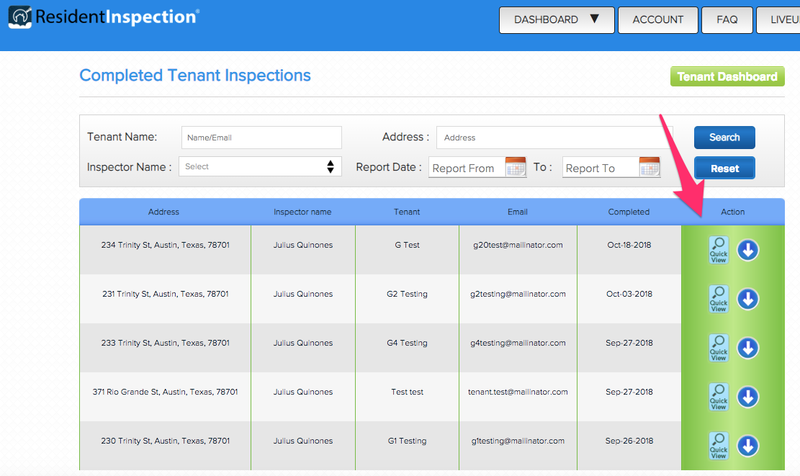 All completed reports will also be available in your Completed Tenant Inspections page. 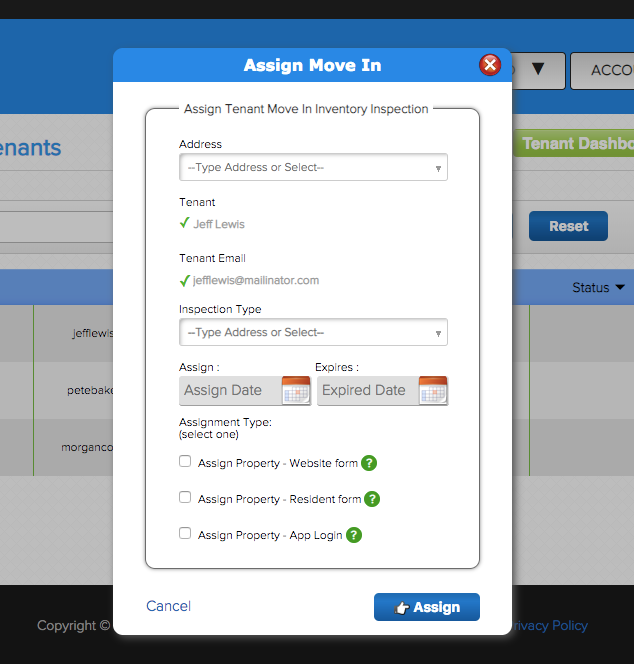 Note: Statuses are also available on your Add/Manage Tenants. 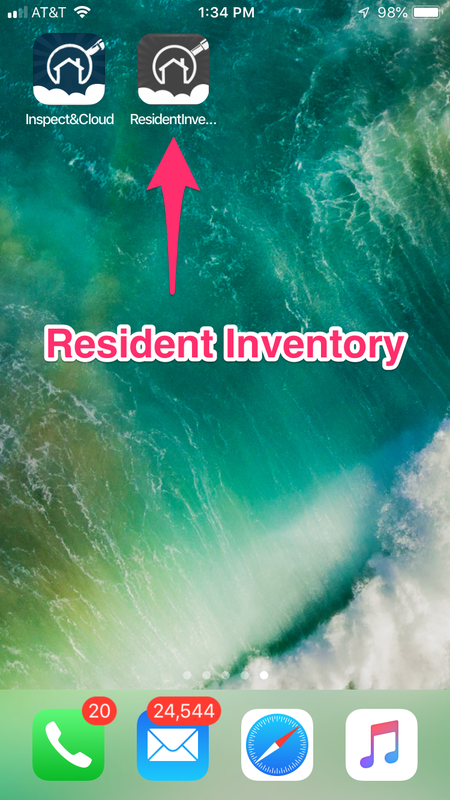 All Properties: displays all properties from your account. This enables you to assign properties from this page. Any properties that have been completed will also display so that they can be re-assigned as needed. Status Only: displays all Assigned, Pending, Expired, and Completed statuses. All Pending: displays All Pending properties. 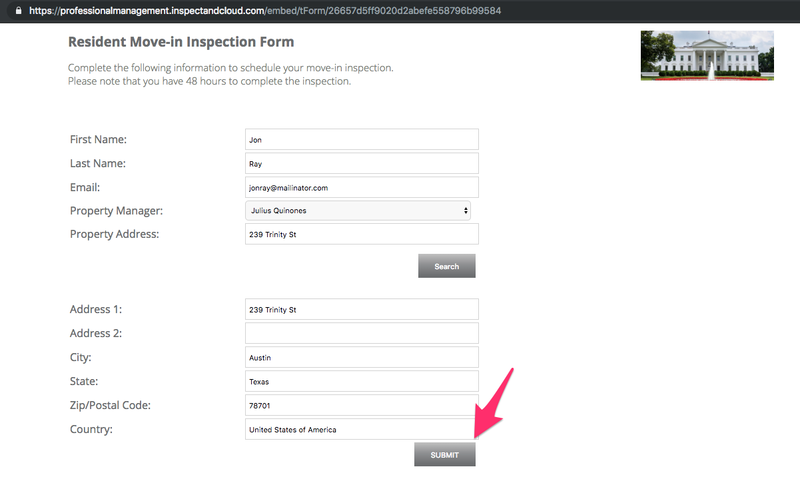 If Pending this means that a tenant has been assigned app login credentials directly (no form request needed) and already has login credentials or the tenant already requested login details. All Expired: displays All Expired properties. 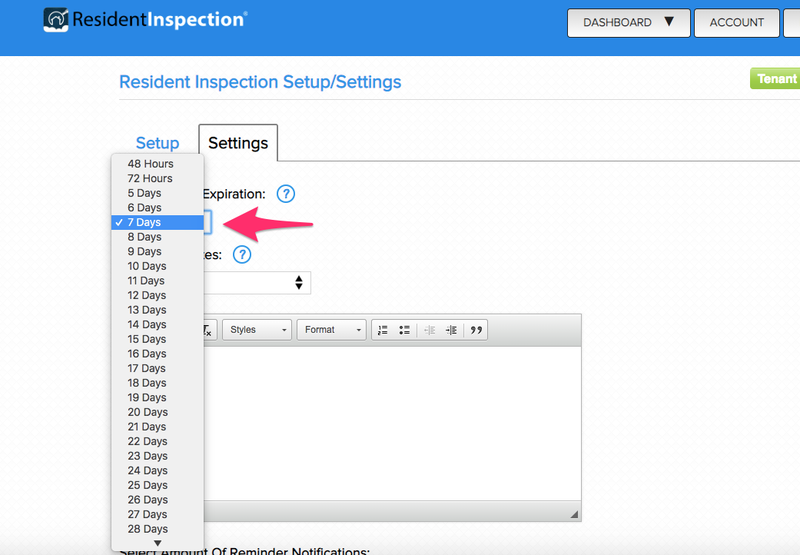 If Expired this means that a tenant has let the expiration time lapse and is no longer able to login unless you as a property manager enable them with more time. 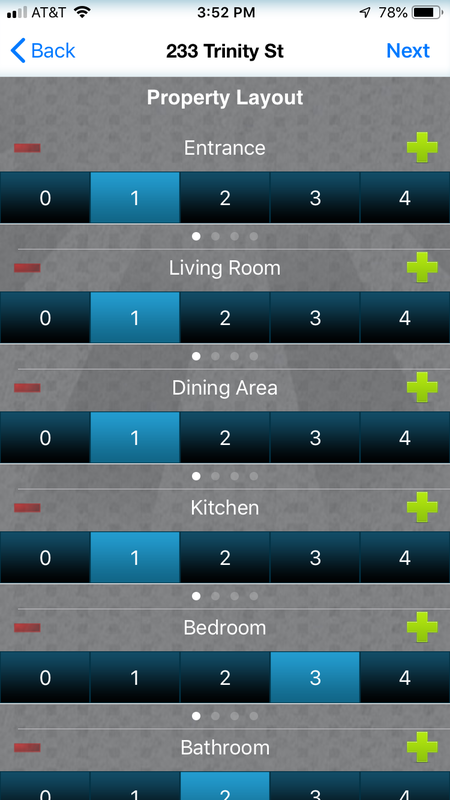 All Completed: displays All Completed properties. If Completed this means that a tenant has completed a tenant move-in inspection and it is available for you to view/download. 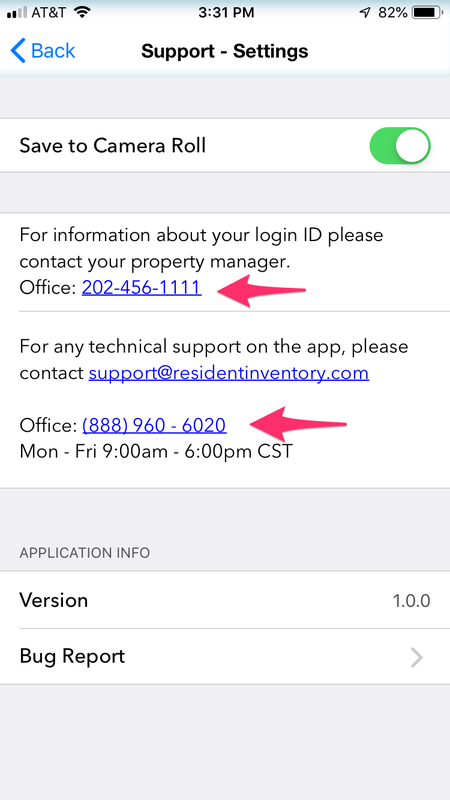 1) Tenant Receives Login Credentials & Instructions to their email – they can also click link to download app. 3) Company Home Screen – from here the user experience is branded to your company. They have the option of clicking on the Support button. 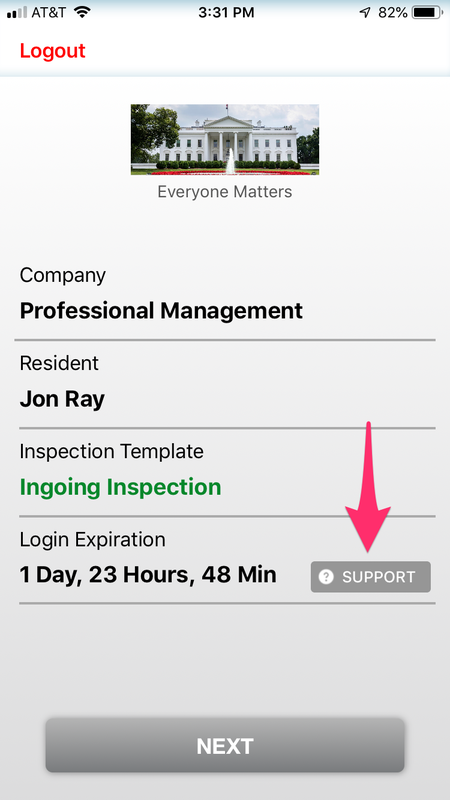 4) Support Screen – this displays your office # for information about login ID’s and also contains Inspect & Cloud’s office for any technical support. 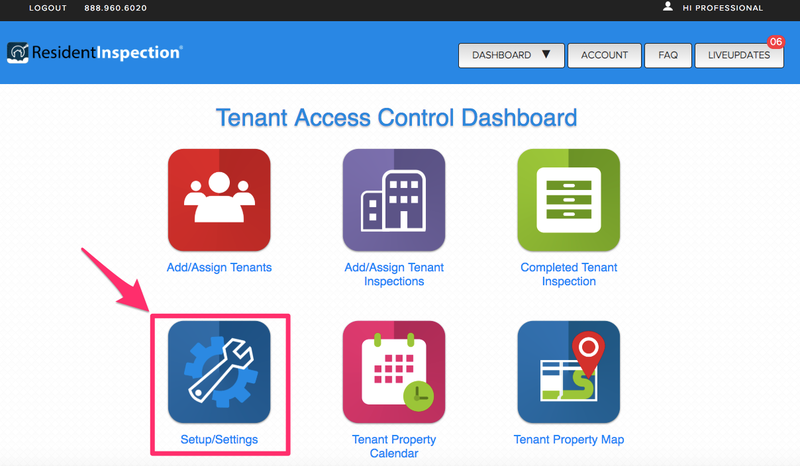 Note: If a tenant’s login is expired they can still login and access the support screen. 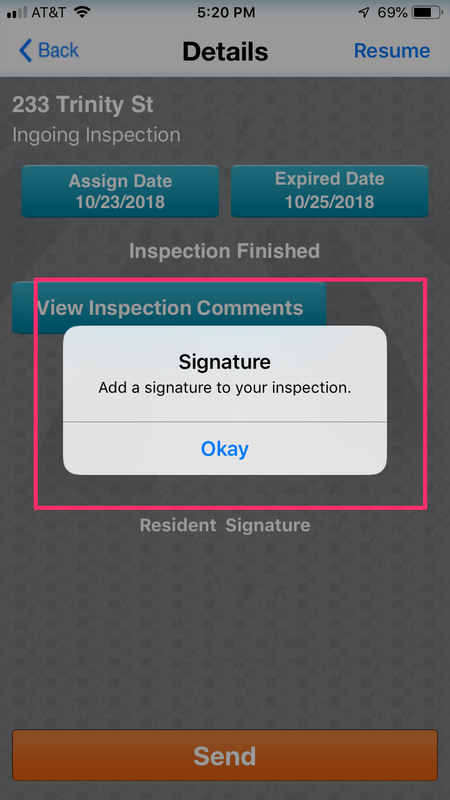 If they click Next and try to start an inspection with an expired login they will receive a prompt message letting them know their login is expired. 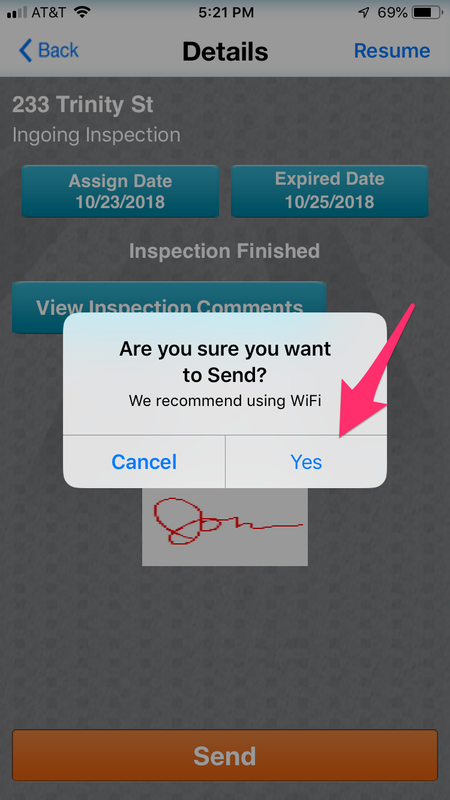 9) Inspection Screen – when tenants click N on a checkbox for any discrepancies then a prompt message will display the first time letting them know that a photo is required. 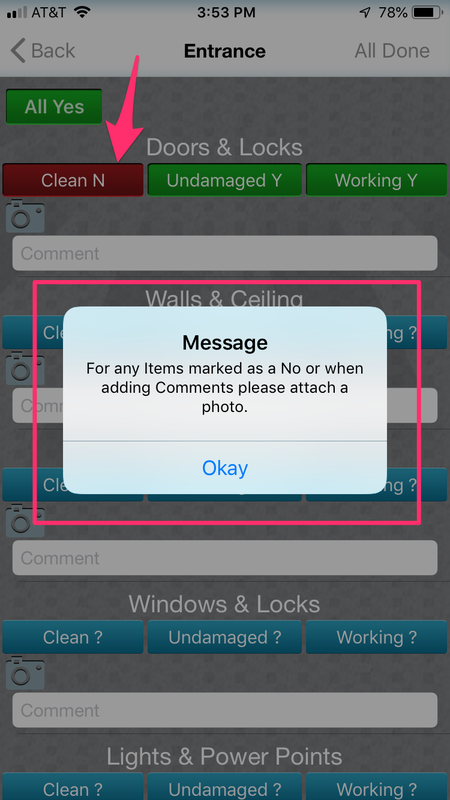 Note: At least one photo is required for any N Checkbox or Comment.After the prompt message displays the first time if tenants try to click N for any discrepancies the app will pull up the camera for them to take a photo. 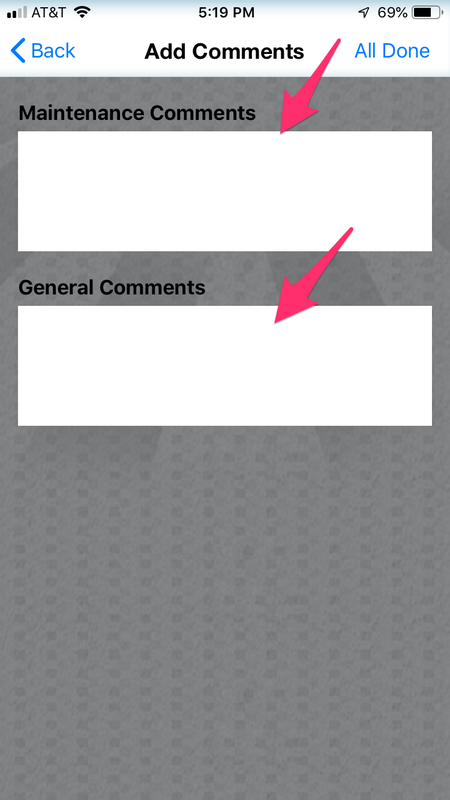 If they try to bypass taking a photo, the app will return the N to neutral or remove the comments. 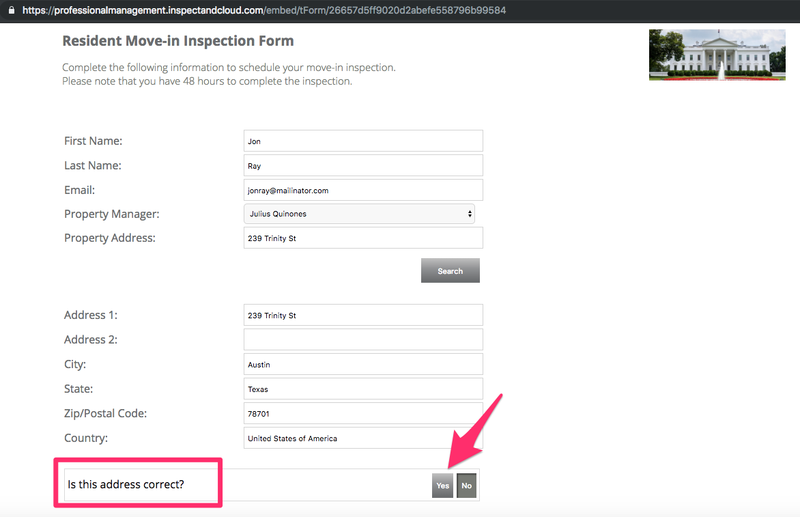 Tenants are not able to resume inspection to re-send any data once it has been sent to the web. 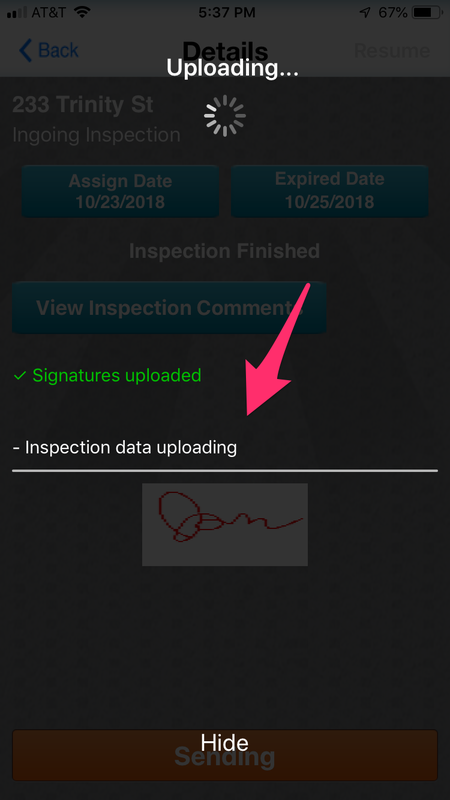 You will receive a notification once they complete with a download link of the inspection. This inspection can be compared using the Move In/Out report to instantly highlight all deficiencies in yellow. 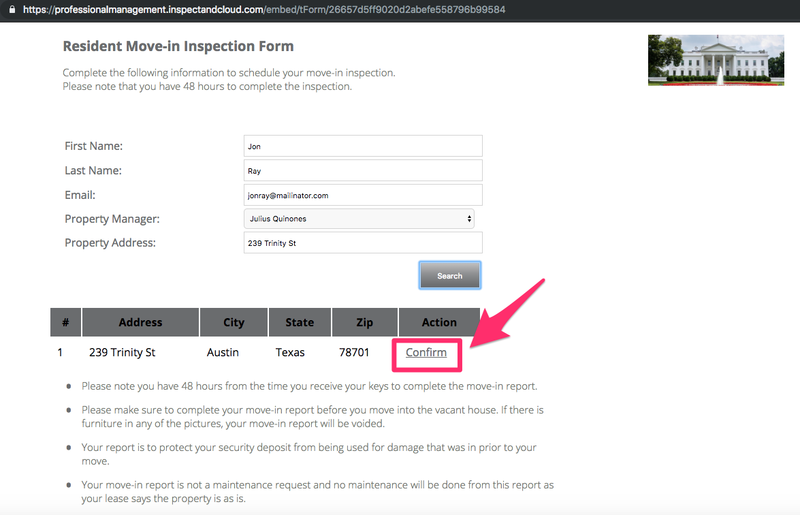 3) Select the Resident Move-In Report and the Inspection you would to compare it to. 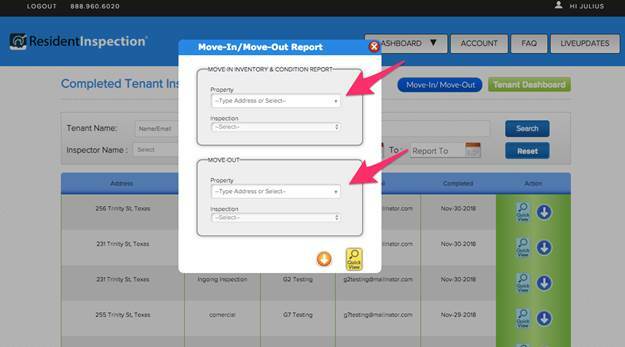 4) Click the Download or Quick View icon and the system will highlight all deficiencies on a side-by-side Move-In/Out Report. 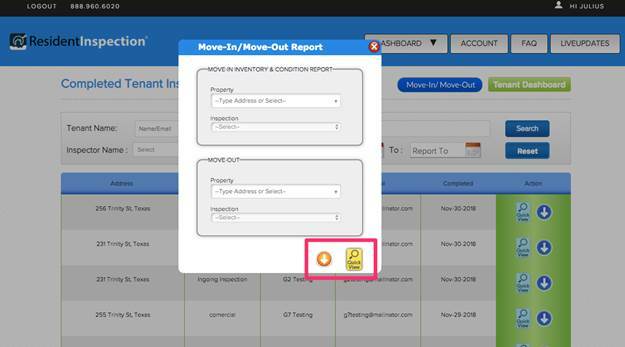 Comparing Resident Reports using the Move In/Out report will instantly highlight all deficiencies in yellow and save you time. 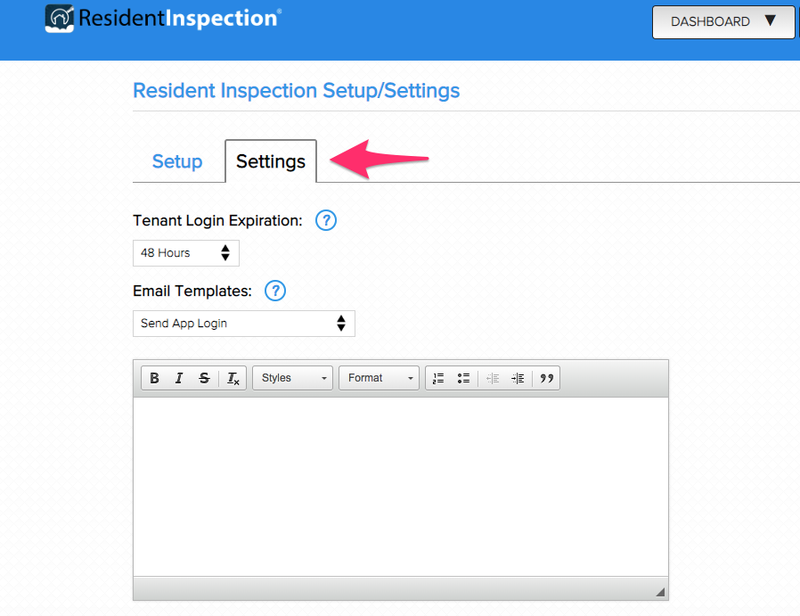 Remember you can compare Resident Reports to any existing inspection you already have completed.